Do you get lackluster performance from employees? Try changing office layouts! Here’s how these simple office layouts can improve happiness and productivity at work. Your office reflects and reinforces your company’s culture. According to Deloitte University Press, 82% of respondents to the 2016 Global Human Capital Trends Survey believe culture is a potential competitive advantage. While a study by Steelcase found that among employees who were highly satisfied with their work environment, 97% felt a sense of belonging to their company and its culture. With results like these, it’s not surprising facility managers are always looking for new ways to improve their office environment. At Office Move Pro, one of the top ways we’ve seen companies strengthen their culture – without moving – is by improving their office layouts. 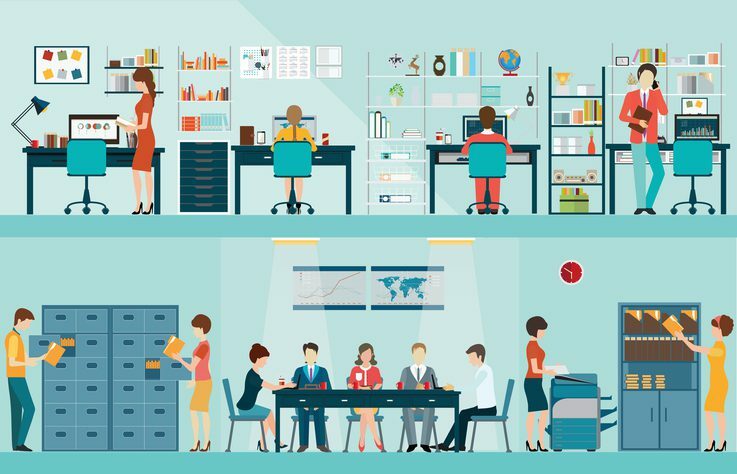 What Are Office Layouts and How Are They Different From Other Office Improvements? Office layouts are changes you can make within your existing space. The changes aren’t extensive, like renovating or moving offices. Instead, you rearrange office furniture, people, technology and other equipment to reinforce your business culture while making the best use of available square footage. For example, if creativity and innovation define your company, but your current office reflects a traditional office hierarchy, your solution might be to diversify work areas. And, you may reduce the amount of space dedicated to physical storage, taking a cloud-based approach. Office layouts also influence job candidates. Since prospects will form an immediate opinion of your company based on your office (think: show me, don’t tell me) the right layout can help you attract top talent, who in turn, are more likely to become invested, long-term employees. What if every employee were happier in their office environment? How much more productive would they be? How would an increase in daily output, less employee turnover, and fewer sick days, impact your bottom line? Your results will vary, depending on how impactful employees find your changes. But, studies have reported a 15% increase in time spent on-task, and as much as 50% improvement to productivity in more menial tasks. Other case studies have revealed more cross-team learning and an increase in the quantity and quality of job applicants. Revisiting office layouts as your business evolves will give you a big boost in productivity. You might not always have the time or resources to adjust your layout yourself, however. But you don’t need to put tons of effort into developing office layouts to get results. Layout changes don’t need to be as complex as knocking down walls. In fact, simple changes like strategically placed furniture, equipment, and even supplies, can produce more effective results than changes that cause disruption to daily workflow. The trick is to make improvements. You might think changing office layouts is a waste of time. But, if your office is comfortable and functional, employees will want to perform at their very best. Look at your office and decide which spaces are working well for your employees. Which are being neglected? Think about how you can encourage behaviours that fit your company culture – like collaboration, mindfulness, or exercise – through design and layout. Your office plan should also reflect your overall business plan. This will help you align your goals and maximize your investments. And finally, consult with professional office movers. Our partners can walk you through all the steps of creating office layouts that boost productivity. And we can help you get moving!